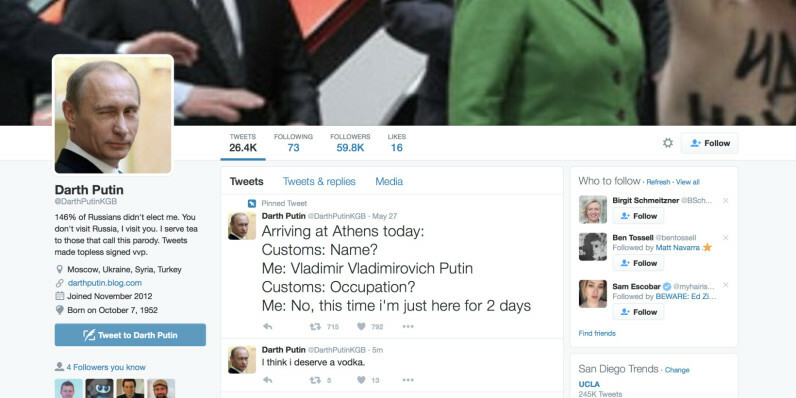 Russian social media users are up in arms over the removal of an account parodying President Vladimir Putin, as well as many others, such as: @SovietSergey, an account that mocks Foreign Minister Sergey Lavrov. The former has more than 50,000 subscribers and it’s honestly rather hilarious. The accounts were pulled yesterday but appear to have made their way back to Twitter around five hours ago. Currently, according to the terms of service, parody accounts are acceptable as long as it’s clear that the account is intended to parody a person rather than attempt to trick Twitter users into believing it’s actually them. Russia isn’t exactly known for its sense of humor, so the question is worth asking if Twitter is bending under pressure from the ex-Soviet state. After their removal, social media users took two Twitter to voice their displeasure with the hashtag #NoGulagForDarthPutinKGB — a reference to the repressive Soviet state — and it’s seemingly worked, as both accounts are back today. Of course, for how long, and why they were removed in the first place are questions that remain unanswered. We’ll update if we hear back from Twitter.